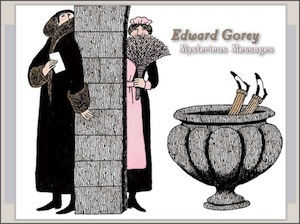 Creator of more than one hundred works—from a wealth of droll, darkly hilarious books to the animated opening sequence of the PBS television series Mystery!—the award-winning author and artist Edward Gorey (American, 1925–2000) once averred that he thought it best if we all felt “uneasy most of the time . . . because that’s what the world is like.” What better way to promote this end than to send an occasional anonymous note or curious card? Women will wonder; boys will be baffled. The enigmatic images on the twenty notecards contained herein will establish a suitable mood for your sphinx-like scribbles and cryptic communiqués.